This is the time of year when I stroll through the gardens, our own and those of our clients, and ask, ‘what improvements could be made’? The bulb catalogues have started arriving and, instead of tossing them into the big garden catalogue basket that I keep handy, thinking I’ll get to them when there’s a break from canning tomatoes or pickling beets and cucumbers, I’m taking the time to really think about how we can improve the early and late spring, and even summer gardens. Tulips are one of the joys of spring but here, if the subterranean critters don’t get them, then the hooved ones will. That said, if you’ve got a protected area that the deer won’t get into and the patience to fabricate or the budget to buy wire mesh cages to protect the bulbs underground, then dive right in and order some tulip bulbs. Daffodils. For my money, one can never have enough daffodils. The varieties are endless, from gigantic to dwarf and everything in between, and different varieties can be staggered for early, mid and late season bloom to ensure color in the gardens while the perennials are making their valiant efforts to emerge. 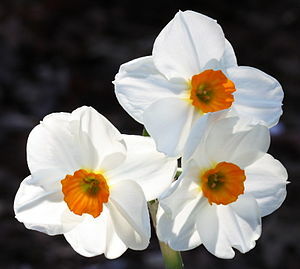 I am particularly fond of the ‘poeticus’ types (tazzeta narcissus). These little beauties are often multi-stemmed and produce several small blossoms on each stem. Many of them are intoxicatingly fragrant and make wonderful flower arrangements and, for this reason alone, I make every effort to order a few dozen bulbs every season and plant them wherever I can find a spot for them. If you don’t have the garden space, you can plant them into pots on the patio or at the front door; you’ll be cheered up by their emergence in Spring. Lilies are a passion of mine that has, in our region, taken on the curse of the abhorred lily beetle. 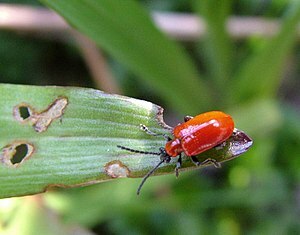 The beetles, a brilliant shiny red, are very visible if you make the effort to look for them as the season warms up. I check the lilies at least twice a day, crushing them between my fingers (apologies to my buddhist friends) or dropping them into a can of soapy water. This doesn’t stop me from ordering more lily bulbs, even when I know that the deer are just around the corner waiting for me to slip indoors so they can chomp off their buds (which means, no lily blossoms for me). Hyacinths. I would like for someone to persuade me to plant hyacinths. Please, if you’ve had success, make a compelling argument and comment below. I love the fragrance of hyacinths and, in close-up pictures, the blossoms look beautiful, but in the gardens we plant, they look stunted, isolated, and frankly, a bit garish. Perhaps in pots they might create a sumptuous, fragrant moment, but I’m on the fence. Allium. 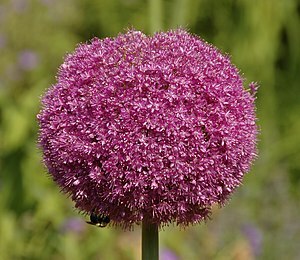 Why doesn’t everyone have loads of allium bulbs in the garden? The deer don’t like them ,although I’ve heard that the voles do, not in our garden but in others’, which answers my question. Even so, survivors will multiply and they make such a dramatic statement in the garden that it’s a shame to not make the effort. Different varieties flower at different times with different colors and can keep the vertical, lyrical, ‘follow-the-bouncing-ball’ theme going for a couple of months. Very uplifting!